I’ve put it out there and I can’t take it back. Too many people know. Too many have heard. I’ve talked about it too many times. There is no turning back. And I do have some fears. What if we don’t make it? What if the current favorable conditions change? What is she gets pregnant? What if there is a downturn in the economy? What if some crisis or urgent thing comes up? There is so much I cannot control. 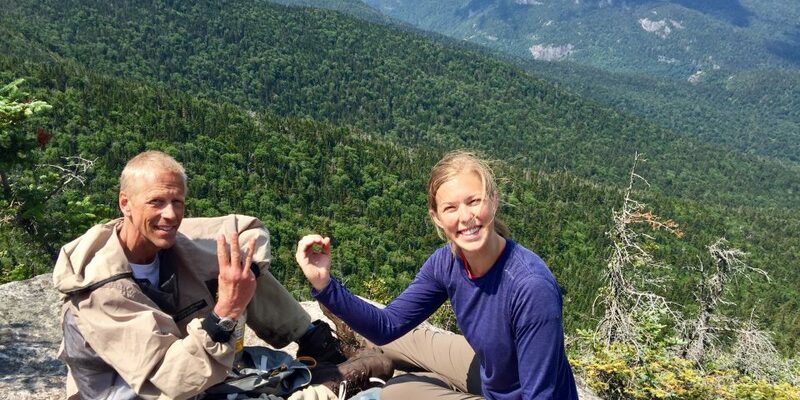 But nonetheless, in spite of the dangers and fears and accountability of it all, I’ve made it clear that by October 2018 my daughter Morgan and I will have summitted the 46 high peaks of the Adirondacks of New York. We will be 46ers. I’m going to need those qualities. Summiting these peaks will not be easy. Over the last four years we have submitted 34 of them. It has not been without trying moments. Being up in the clouds during thunder and lightning is no picnic. Dislocating my shoulder 13 miles from help and having to climb with only one arm up a straight 100-foot cliff was the closest to a near-death experience that I’ve had. The expenses have piled up too—airline tickets, microspikes for climbing, ropes, a premium membership to AllTrails (to GPS these hikes using only satellites), and other assorted essential gear have all made it possible to get to this point. We have endured searing heat and bitter cold. And there is more to come. In the second week of June we will take a long weekend and get two of the most difficult climbs in, which will include the Santanoni Range of Panther, Couchsacharaga, and Santanoni. We will also summit Allen Mountain—likely the longest and perhaps the hardest of the peaks. We will then go out for another long weekend in July where we will summit the twin peaks of Cliff and Redfield, hit Blake and Colvin, and then, if we’re not totally spent, we will summit Colden right before we leave. That leaves this fall. Likely in September we’ll go out for one more long weekend. The first hike will take us to the summit of Sawteeth. Then will come the grand conclusion: The twin peaks of Esther and Whiteface. If Whiteface sounds familiar, it is because it has been the site of four different Olympics in Lake Placid, New York. Because of this, there is a road that you can drive to the summit (we won’t be taking that route!) where we will meet with our family, who will be there to help us celebrate the huge milestone of becoming 46ers! (You can Google any one of these summits to see what these mountains look like). Vision is hard work. It can take years. You endure a lot. It takes planning, research, time, money, sacrifice, great communication (Morgan lives out of state), the help and experience of many others, the right tools, the right people, the right execution, and SMART goals. And it takes courage. I’ve put it out there that it will happen. Later this year, on November 1, everyone will know either way. Let me tell you what I see: all I see is Morgan and me at the top of Whiteface, with the people we love the most—smiling, laughing, and probably crying in our exhaustion over the realization of a vision that began as only a dream. When you think of asking me in November if the vision was worth it, don’t even bother. We both know the answer. Image used by permission of Jeff Boersma.